Tuhin Virmani, M.D., Ph.D., left, is director of the Movement Disorders Clinic, which has added a Huntington's Disease Clinic to its services, spearheaded by Rohit Dhall, M.D., right. May. 22, 2018 | May 22, 2018 | The Movement Disorders Clinic at the University of Arkansas for Medical Sciences (UAMS) is offering a monthly clinic for Huntington’s disease, featuring a multidisciplinary approach to care that aims to be a one-stop shop for patients. The clinic’s multidisciplinary team includes movement disorder neurologists, nurses and nurse practitioners with expertise in Huntington disease, social workers, nutritionists and speech and physical therapists. The clinic partners with neuropsychologists, psychiatrists and genetic counselors for quick referrals. Huntington’s disease is an inherited neurological condition that slowly causes a breakdown among the nerve cells in the brain, which affects movement, thinking and mental state. As the disease progresses, people with Huntington’s need help with all aspects of their daily lives and become bedridden in the final stages of the disease. To make an appointment, call 501-526-5443. Huntington’s is a rare condition affecting about 30,000 people in the United States and 150-200 in Arkansas. While there are no treatments that stop the disease’s progression, there are supportive care resources and medications to help patients manage symptoms. There have been advancements in care, with newer medications developed in the past five years. Dhall also hopes to connect patients with Huntington’s research. He has experience in clinical trials for Huntington’s disease and worked on trials for two medications aimed at helping patients maintain motor skills. The clinic can also connect patients with genetic testing and counseling, which is an important part of Huntington’s care. Each child of a parent with Huntington’s has a 50 percent chance of inheriting the disease. Working with a genetic counselor is helpful for people considering being tested for Huntington’s or people with Huntington’s who are considering having children. 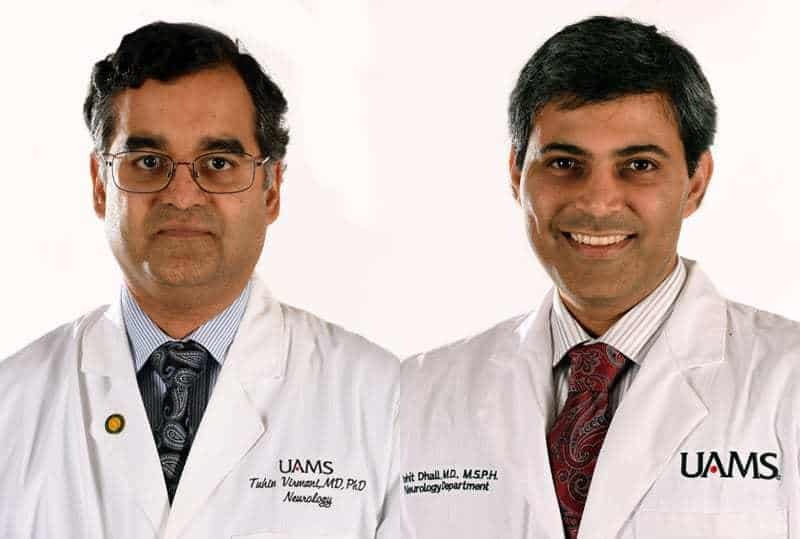 Tuhin Virmani, M.D., Ph.D., is director of the Movement Disorders Clinic at UAMS and said the Huntington’s clinic adds to its overall mission of serving patients with movement disorders, which includes Parkinson’s disease and essential tremor.